(Nanowerk News) Nanoscale gold particles are currently intensively investigated for possible applications in catalysis, sensing, photonics, biolabelling, drug carriers and molecular electronics. The particles are prepared in a solution from gold salts and their reactive gold cores can be stabilised with various organic ligands. Particularly stable particles can be synthesised by using organothiolate ligands that have a strong chemical interaction to gold. The chemical process of preparing such particles has been known since the mid-1990s and many different stable sizes and compositions are known. 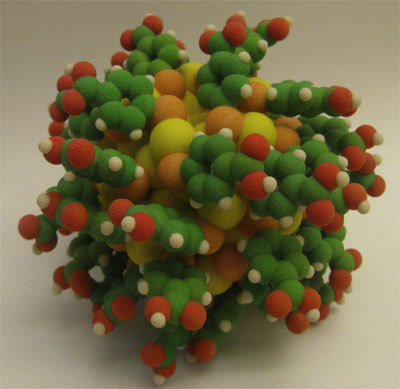 An atomistic model of the Au102(p-MBA)44 particle. Gold:yellow, sulfur:orange, carbon:green, oxygen:red, hydrogen:white. However, the first definite information of their atomic structure became available only in 2007 when the group of Roger Kornberg (Chemistry Nobel Laureate 2006) at Stanford University succeeded in making single crystals for X-ray diffractometry containing only one type of a particle having 102 gold atoms and 44 thiolate ligands, the so called Au102(p-MBA)44 particle. The structure was reported in Science in late 2007 . The theoretical analysis of this and other thiolate-protected gold clusters, led by Professor Hannu Häkkinen at the University of Jyväskylä in Finland, resulted in a theoretical framework that can be used to understand the stability and electronic structure of these particles. This work was reported in the Proceedings of the National Academy of Sciences in 2008 . Now, researchers in the Department of Chemistry and the Nanoscience Center (NSC) at the University of Jyväskylä, in collaboration with the Kornberg group, report the first full spectroscopic characterisation of the absorption of electromagnetic radiation by the Au102(p-MBA)44 particle in solution and solid phases. The study was published in the Journal of the American Chemical Society on 24 February 2011 . The spectroscopic study was performed in a large range of electromagnetic spectrum from mid-infrared ("heat absorption") to ultraviolet light. "The study was technically demanding and could only be made now when the Stanford group has succeeded in refining the synthesis to produce pure Au102(p-MBA)44 product in large quantities," explains Adjunct Professor Mika Pettersson, who led the experimental work at the NSC. "We document clear "fingerprint" features in the absorbance spectrum that can be used in the future to benchmark chemical modifications of this particle for various applications. The work also establishes the molecular nature of the clusters by the observation of a band gap of 0.45 eV, in excellent agreement with theory. We were able to analyse these features from large-scale computations using the known structure of Au102(p-MBA)44 and thus fully understand the absorption characteristics of this particle," says Professor Häkkinen. The other researchers involved in the work are Eero Hulkko, Jaakko Koivisto and Olga Lopez-Acevedo from the University of Jyväskylä. The pure samples of the Au102(p-MBA)44 particle were made by Yael Levi-Kalisman in the Kornberg group. The work at the NSC and the Department of Chemistry at the University of Jyväskylä is funded by the Academy of Finland. The massively parallel computations, using up to 2048 processor cores, were made in the Louhi supercomputer at CSC – the IT Center for Science. The Journal of the American Chemical Society on 24 February 2011 1. P.D. Jadzinsky, G. Calero, C.J. Ackerson, D.A. Bushnell and R.D. Kornberg, "Structure of a thiol monolayer-protected gold nanoparticle at 1.1. Ångstrom resolution", Science 318, 430 (2007) (www.sciencemag.org/content/318/5849/430.abstract). 2. M. Walter, J. Akola, O. Lopez-Acevedo, P. D. Jadzinsky, G. Calero, C. J. Ackerson, R. L. Whetten, H. Grönbeck, H. Häkkinen, "A unified view of ligand-protected gold clusters as superatom complexes", Proc. Natl. Acad. Sci. (USA) 105, 9157 (2008) (www.pnas.org/content/105/27/9157). See also http://gtresearchnews.gatech.edu/newsrelease/gold-nanoclusters.htm.